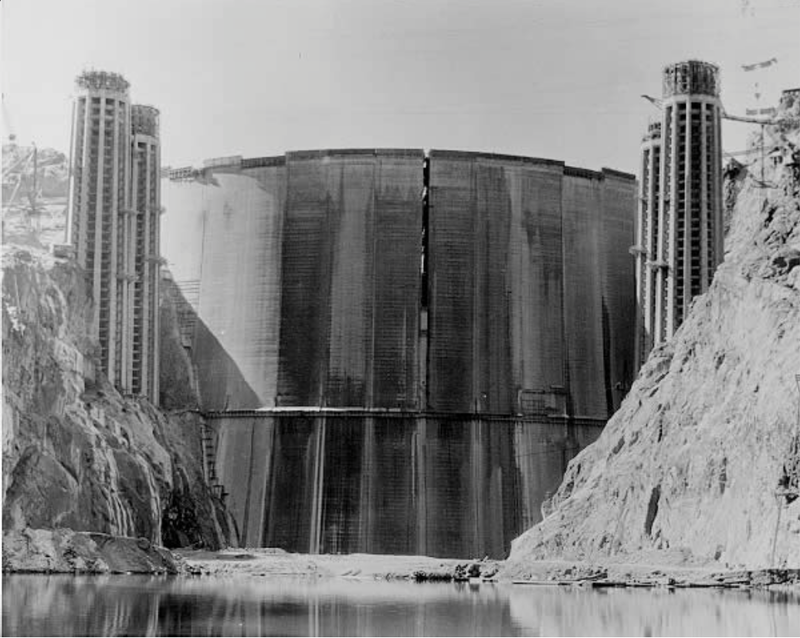 Back of Hoover Dam prior to first fill photo via Reclamation. Imagine this: It’s 2030. The Colorado River, sapped by record high temperatures, is seeing its biggest reservoirs — Lakes Powell and Mead — plummet to near dead pool elevations. Negotiations to mandate increased water conservation in Arizona and California have stalled. Throughout the southwest, frequent water shortages continue to scare off new businesses. Bad blood among states simmering for years boils over with an exchange of nasty letters. Water managers in California, receiving less and less water from the Colorado River each year, feel slighted and start making demands for their share, kicking off a decade long legal battle. Ripples are felt all the way from Los Angeles to Denver. To some water managers this nightmare is far from fiction. And without immediate action it could very well come true. To talk about the Colorado River’s present and future, you need to start in the past. One of the most important dates in the river’s history is Nov. 24, 1922, when leaders from the seven Western states that rely on the river met at a Santa Fe, New Mexico resort to sign the Colorado River Compact. Pilloried for decades for its structural problems, the compact did accomplish a few basic things. To make it easier to govern, the agreement divided the river into halves: the Upper and Lower Basins. The Upper Basin includes the snowy Rocky Mountain states of Colorado, Wyoming, Utah and New Mexico. The Lower is home to the desert landscapes of Arizona, Nevada and California. Engineers used stream gauge data to estimate the river’s annual flow and the politicians took those measurements to divide the water amongst themselves. Each basin got 7.5 million acre-feet…and each state within the basin got a portion of the water. California then and today is the largest user of Colorado River water. California’s use of the river’s water is what brought these political figures together in the first place, Mueller says. Concerns about the state’s rapid development were growing louder. If the whole watershed functioned under the frontier water law doctrine of prior appropriation (where the person who claims the water first is given priority in receiving it) California could end up owning every drop. To get a deal, the Upper Basin agreed that Lower Basin states would be guaranteed a certain amount of water right at the line that divides their two regions. Some years would be wetter, some would be drier, but the decade-long rolling average couldn’t dip below 75 million acre feet of water, measured at a spot just below Glen Canyon Dam in northern Arizona. If it did drop below that point, then the Lower Basin could come calling for its water. This system works fine when there’s enough water to go around. But that’s the signature bug of the Colorado River: More water exists on paper than in reality..
As of 2016 the Upper Basin is going above and beyond its ten-year obligation to the Lower Basin. According to the Upper Colorado River Commission, the 10-year total flow, starting in 2007, was just over 91 million acre-feet, well above the obligated 75 million acre-feet. But continuing dry conditions like those recorded during the winter of 2018 could quickly erode that. 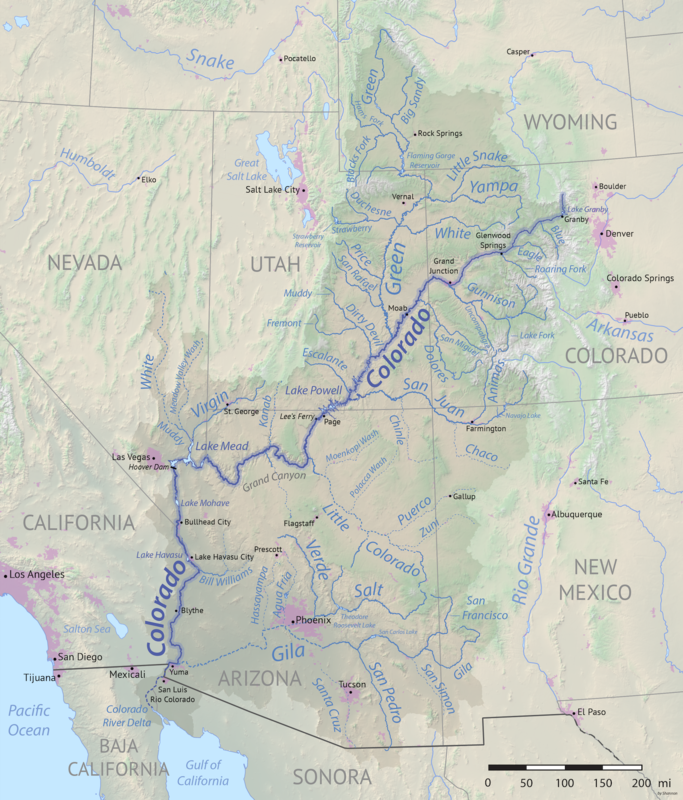 In Colorado, the largest user of the Colorado River’s water in the Upper Basin, the threat of a compact call has prompted ongoing discussions within the state engineer’s office. Those plans are closely held to avoid intrastate fights over future water plans, the Colorado River District’s Andy Mueller says. The state also wouldn’t want to give other Colorado River water users insight into future legal strategy should the call move from thought experiment to reality. While the thought of a Compact Call strikes fear into Upper Basin water managers, it’s less on the minds of their Lower Basin counterparts. “I was surprised to hear the Upper Basin express their concerns and fears when it’s not something we’ve even thought much about in the Lower Basin,” says Jeff Kightlinger, general manager of the Metropolitan Water District of Southern California, the water wholesaler for the greater Los Angeles area. “But every time we have a conversation with the Upper Basin you can tell it’s very front and foremost in their minds as something that they really want to work on and avoid,” he says. For a call to materialize, water managers like Kightlinger and farmers throughout the southwest would need to apply pressure to their state leaders. And right now, he says they have way bigger fish to fry, like keeping Lake Mead from entering into shortage and negotiating a drought contingency plan that would require Lower Basin states to cut their water use sooner than is currently required. But Kightlinger says he understands the Upper Basin’s fears. 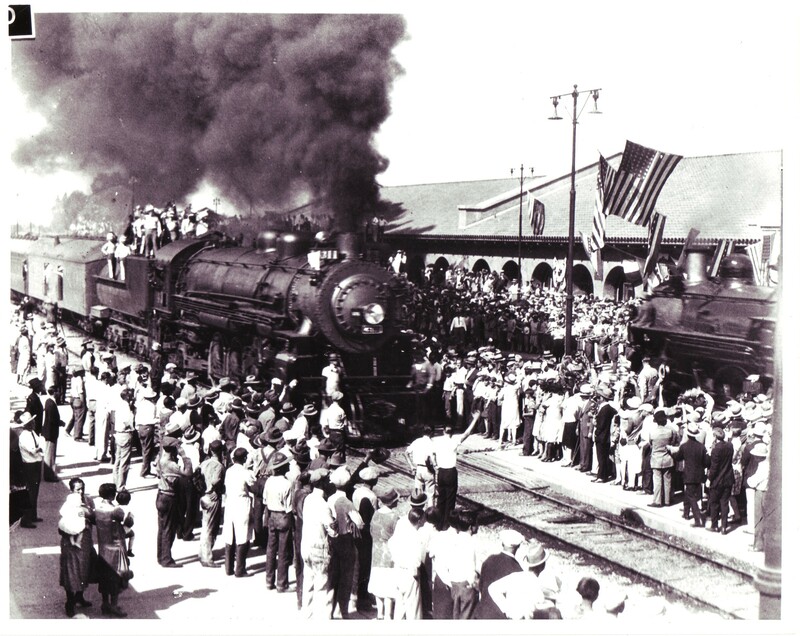 First Train in Phoenix. Image Courtesy of the Arizona Historical Society. Snowpack for 2018 has ended and the projected unregulated inflow for 2018 is 5.25 million acre-feet or 48.4 percent of the 30-year average, said Bret Esslin, Arizona Department of Water Resources’ Colorado River Management division, in his report. The most probable release from Lake Powell is 9 million acre-feet. Esslin said the probability for shortage increased to 52 percent in 2020 and escalated to 68 percent by 2022. Whether or not a shortage is declared will be determined when Bureau of Reclamation releases its 24-month study in August that estimates the elevation of Lake Mead and Lake Powell in January, Clark said. Clark said addressing potential shortages through development of a Drought Contingency Plan is vital for the state.